Eurocom delivers the Fox 4.0, a new 15.6" laptop that weighs 2.5kg and provides Intel Ivy Bridge processors, up to 16GB DDR3-1600, NVIDIA GeFroce GT 650M graphics and up to 3TB HDD storage. Eurocom Corporation (www.eurocom.com), a developer of long lifespan, high performance, fully upgradable Notebooks and Mobile Workstations has launched a small form factor notebook with up to 3 terabytes storage via three 1 terabyte storage drives, 3rd Generation Intel Core i7 Ivy Bridge Processors, up to 16GB DDR3-1600 RAM and NVIDIA GeForce GT 650M graphics with Optimus technology. “The Fox 4.0 is a 15.6” system that is very thin and light, with a very long battery life. It is the perfect system for anyone who leads a fast paced life and needs their notebook to be by their side 24/7” says Mark Bialic, Eurocom president. The EUROCOM Fox 4.0 has a 15.6” full HD 1920x1080 display. Customers can choose between Matte or Glossy displays. Driving the system is an Intel Core i7-3820QM processor running at up to 3.7 GHz with 8MB of L3 cache, which delivers exceptional high-def multimedia, multi-tasking and multi-threaded performance. It also supports the newest line of Intel Core i7 processors. These high-performance CPUs allow users to simultaneously run multiple applications at the same time -- all with increased performance. Up to 16GB of superfast DDR3-1600 SODIMM memory is also supported via two channels. Featuring graphics technology based on NVIDIA GeForce GTX 650M GPUs featuring 384 CUDA cores, 1 GB of DDR5 video memory, with the graphics clock running at 850MHz this new graphics powerhouse is the ultimate mobile gaming machine. 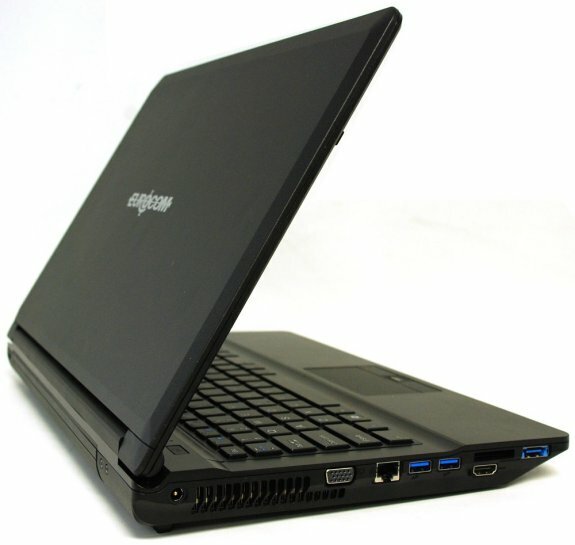 With Optimus support, the EUROCOM Fox 4.0 can run for 240 minutes on one charge. “With support for 3TB of storage, 3rd Generation Intel Core i7 processors and NVIDIA GeForce GT 650M graphics with Optimus makes the EUROCOM Fox 4.0 at only 1.6” thick, one of the best combinations of pure computer power and capability, with mobility and long battery life” Mark Bialic. The EUROCOM Fox 4.0 is built with an ultra heavy duty design for unintentional abuse while on the go. It is a fully upgradeable system with support for the best in mobile technology. The Fox 4.0 can be customized based on processor, memory, storage, display and wireless technology. The Fox 4.0, which measures 14.96" x 10" x 1.61" and weights just 5.7lbs, also supplies tremendous SATA-3 storage allowing users to save more of their favourite photos, music, games, and more, as well as headroom to install additional office and entertainment applications. Customers may also choose between RAID 0, RAID 1 or RAID 5 for the ultimate transfer rates and application load times or redundancy.